Yep, that's me & my beautiful 2 inches of roots I'm showing you. I blog over at A Day in the Life of a Mom & a Wife. My blog is mostly just random life stuff about kids, husbands, crafty things, sewing, tattoos, pictures, beauty products, nerdy book stuff, and a little cooking here and there. You can read a little more about me & my family here and here. 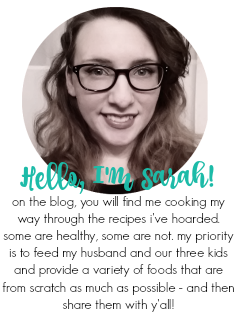 If you are a fan of Sarah's blog then you are obviously pretty awesome. I'm pretty awesome too, so I hope you enjoy my blog!